Mom and I love to bike. It's about as close as we'll ever get to jogging. She's just not a jogger. After her knee injury in January, I wasn't sure we'd ever get to bike again, but we're back in the saddle now. Yay! Mom has joined up with her new friend Katie for the Walking Challenge, to make sure we stay motivated. I'm all for that, cuz us dogs gotta have our exercise. You can read all about the Walking Challenge at All Things Dog Blog, or visit Katie' site, Lessons from 4 Legs. Us dogs sure DO need our excersize! I am with you on that one bud! Good for you for getting back on your bike after a knee injury. Sadly, I would never be able to ride with Chester and Gretel running with me. They're too short and dart all over the place. It's too bad because I love to ride my bike! 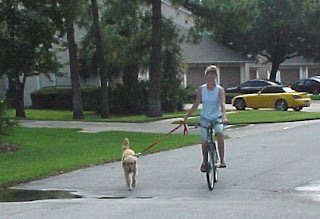 My Mom takes me biking too, although I'm only a little Westie! Nice site, will visit again.